Per the new api, you must sign in via twitter in order to use the search functionality. There are some notes on this implementation using node.js in this blog post. All of the information below pertains to the old, no-longer-working version. For tweets that include lat/long information, the county is determined via a dynamic call to the FCC census block conversions api (I haven't gotten around to geocoding this map which would make this step unnecessary). There are already tweet maps out there - enough to make me think I should have named this little project "Yet Another Tweet Map". Most seem to use the google maps api. Some of these are also hooked straight into the twitter public stream api rather than simply making use of the twitter search API as is done here. I definitely appreciate the challenge with this kind of thing. There is so much information to try to present in a sensible fashion. The page starts with a sample search that demonstrates what I considered to cover the most likely scenarios: requiring something to be in the search, and something to not be in the search. Searching can be done in a somewhat "google-like" manner, although you've got to include a "+" to force the term or quoted phrase to be there. You can also make sure that a term not be included by prepending a "-". If neither prefix is included, then the term is optional. The entered search string is mapped to the proper format needed by the twitter api itself. Well, the version 1 api, which is deprecated and will be unavailable at some point. The v1.1 search api requires a "signed user context", which involves using oAuth with twitter, and that's a little project for another day. One interesting challenge with this is that there can of course be a burst of tweets, and decisions must be made as to how much of the burst to display. Some of the other tweet maps out there have to deal with this to an even great degree. It's not clear how to show all of the tweets on the map in any reasonable time frame while preserving readability. So, I don't even try. If there are more than a certain number of tweets returned for a given search (five in this case), I let the tweet popup on the map, but quickly shove all but the last handful of tweets into the list on left. As tweets occur in a county, its color is gradually changed, ultimately resulting in a solid red county once a certain threshold is reached (ten tweets in this case). In parallel with this color change, the border of the all corresponding tweets in that county that are already in the list will change as well. 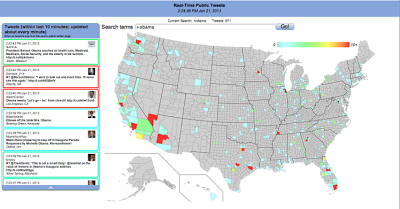 Moving your mouse over a county will bring up a list of all of the tweets recorded for the county itself. I have previously written a short note on making an svg legend with D3. The legend here is placed above the Great Lakes. There is also space out in the Atlantic, but it seemed to feel a little lost out there. I toyed with the idea of using some kind of shape that followed the contour of the lakes or follow the northern border of the US, rather than the rounded rectangle, but decided that it might be a distraction. Nevertheless, it can still be interesting to watch it happen as it gets there.